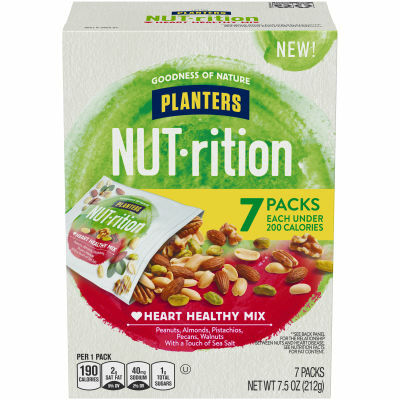 Planters NUT-rition Heart Healthy Mix is a deliciously crunchy mix of peanuts, almonds, pistachios, pecans and hazelnuts. We selected these nuts to provide a good source of 6 essential nutrients. And guess what? They may reduce the risk of heart disease so your heart will love them as much as your mouth! Serving size 1 pack (30.6g).